Wonton's literal meaning is cloud swallow, sounds appetizing right? I think it refers more to a pillow like skin puffed up with a filling. Wonton skin is made of flour, egg and water. Typically wonton is filled with meat, garlic, green onion and spices. The most common cooking methods are boiled in soup or deep fried, and a more Americanized version bakes them. These little pillows can be sealed shut several ways, with a simple triangle being a very versatile shape, and the crossed hands version also quite common. Wonton is often served during dim sum, which I can easiest explain as an appetizer meal served at brunch. 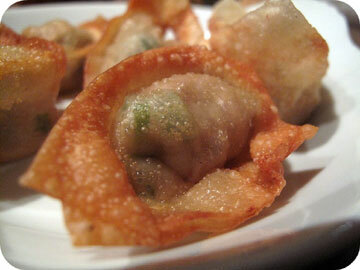 American fusion can be thanked for several additional ways to prepare wontons, including filling with sweet fillings.  Moisten all the edges of the wonton wrapper with water or with lightly beaten egg. Keep a small bowl of water on hand to re-wet the edges if needed.  Place about 1 teaspoon of uncooked filling in the center of the wonton wrapper.  Fold the wonton wrapper in half lengthwise, making sure the ends meet. Press down firmly on the ends to seal. Use your thumbs to push down on the edges of the filling to make sure it stays centered in the middle.  Keeping your thumbs in place, fold the wonton wrapper over one more time.  Push the corners up and hold each corner in place between your thumb and index finger.  Bring the two corners together so that one overlaps the other. Press together to seal. All Done! Follow this link for more directions and pictures to guide you on how to fold wontons. Now that you know how to fold a wonton, you can add them to soups, or serve them as appetizers. This is one of our favorite wonton soup recipes. 1 Reserve one green onion top for garnish; chop remaining green onions. 2 Combine chopped onion, ground beef, celery, parsley, salt and pepper in a small bowl; mix lightly. 3 Place approximately 1 1/2 tablespoonsful of ground beef mixture in center of each wonton square. 4 Lightly dampen edges of square with water. 5 Bring together corners; pinch to seal. 7 Bring broth to boil in large saucepan; reduce heat to medium. 8 Add 1/2 of wontons; simmer 4 minutes. 9 Remove cooked wontons with slotted spoon; keep warm. 10 Repeat with remaining wontons. 11 Cut reserved green onion top into thin diagonal slices. 12 Add to hot broth with spinach and carrot. 13 Place wonton in soup bowls. 14 Top with broth mixture. Typically we substitute the ground beef for ground pork. We also experiment with different vegetables, adding mushrooms, water chestnut, cabbage, bean sprout or other things to the soup. Tofu is also a delicious addition. These additions can be added prior to adding wontons, then adding wonton in the last 4 minutes of cooking.